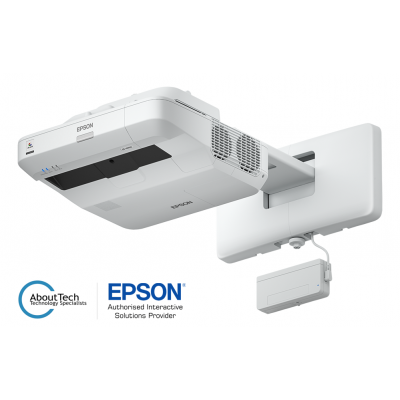 This is the Epson EB-1450Ui Finger & Pen Touch Interactive Ultra Short Throw Projector. The necessary wall mount is included with this model. Epson's MeetingMate interactive projectors provide the complete solution for any meeting room and is the perfect alternative to copyboards, conventional whiteboards and more - in one simple device. MeetingMate facilitates productive meetings and enhances collaboration - with PC free whiteboard, dual pen interactivity and flexible content sharing options (via USB, print or email). Brought to you by Epson, the world's number 1 in projector technology. AboutTech is an Australian owned, professional AV integrator. We are dedicated to delivering quality service and tailored solutions. We supply and install a diverse range of AV solutions to education, corporate and government sectors. Please Note: All pricing in Australian Dollars ($AUD) and is ex GST unless otherwise stated.